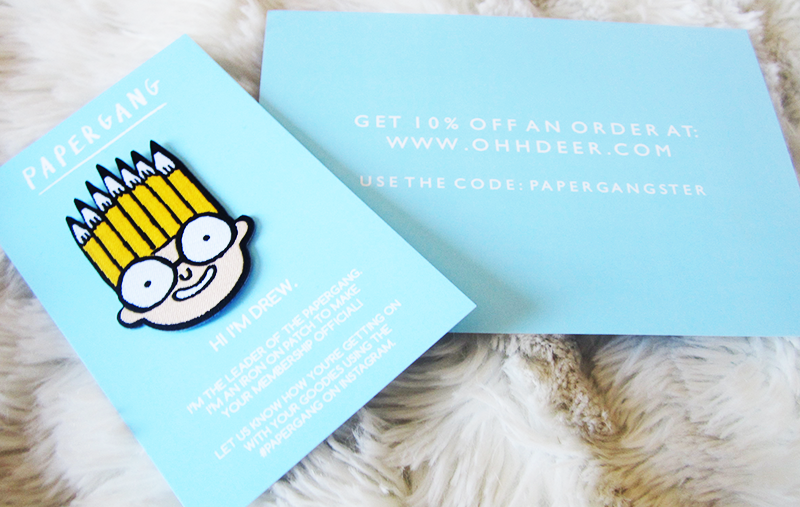 One of the first things I noticed in the box was this adorable patch of Drew the 'leader' of the Papergang, which I just thought was a really cute little touch especially as patches are so trendy these days. And how can you not love that pencil crown? There was also a cute little piece of paper with different eyebrow illustrations and on the back it had a code for 10% off at OhhDeer - yay! The next two things I noticed were these adorable cards. 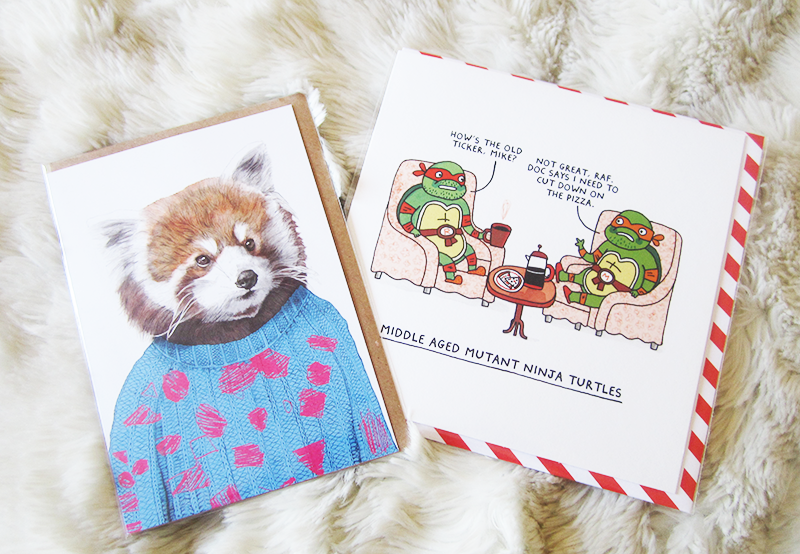 The one on the left is Howard the Red Panda by Jamie Mitchell, who is one of my absolute favourite illustrators so obviously I was super happy to receive it. I'm genuinely considering framing it instead of using it as a card because I like it that much. The other is Middle Aged Mutant Ninja Turtles by Gemma Correll, who is a hilarious illustrator - so definitely check out her work if you never have! 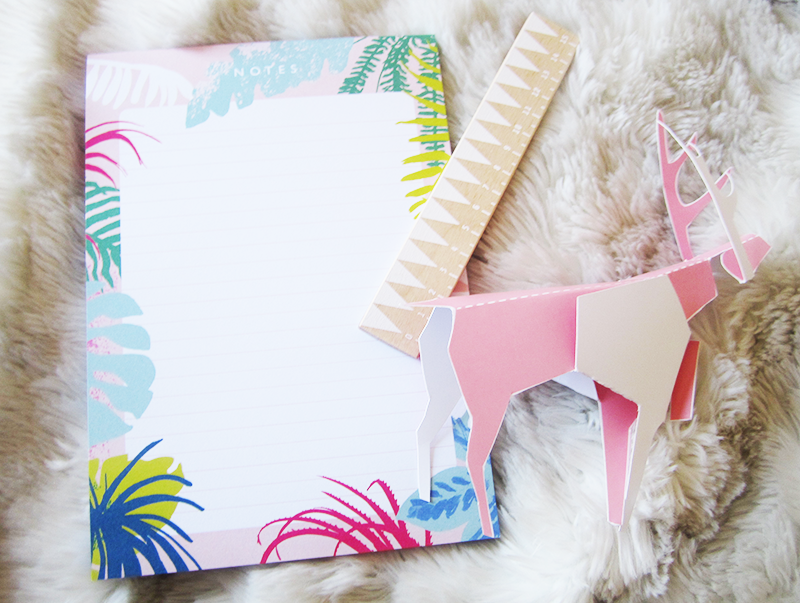 Next up is one of my favourite things in the box, this gorgeous tropical notepad! Like seriously it's so pretty and will be a bit of a lifesaver for planning out revision whilst I have exams. Also included was this adorable little wooden ruler, which I just think is super cute. Admittedly I don't ever use rulers, but it's nice to have one around just incase I need one. The next thing, which was a lovely little surprise was this little origami stag DIY. It's actually on the back of the box, and you had to cut it out and fold it to create your little stag. It's safe to say I epically failed at doing it properly, but I thought it was such a nice little touch! The final two things were these minimal prints. 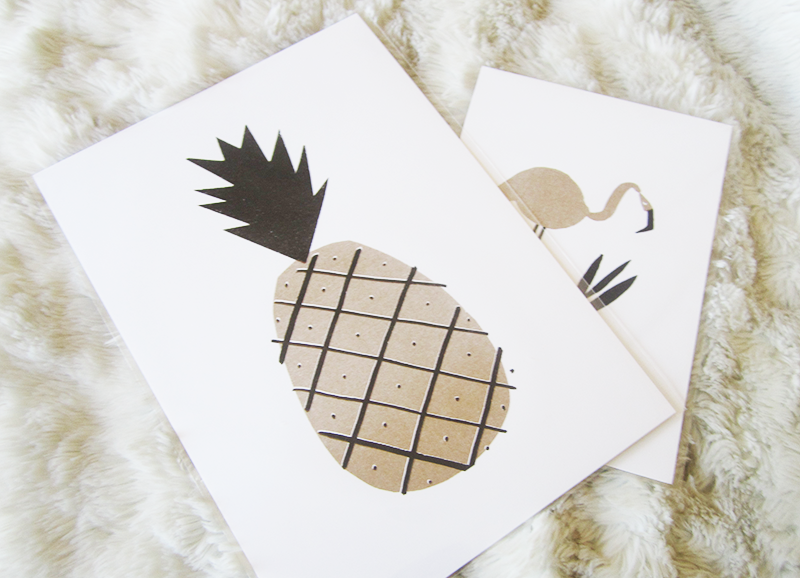 If I'm honest, they aren't really my style as they're very minimal but I definitely think I'll be keeping the Pineapple print and putting it around somewhere, because pineapples! All in all I was very pleased with my Papergang box, and I loved how it had a slight tropical theme too. At £9.95 (+ £1.95 shipping for UK) it's definitely value for money and I'd really recommend them giving a go. This will be my last box purely because I can't really justify indulging in it every month when I'm on a student budget, but I loved getting a box and will probably by a one off box some time again in the future! If you want to subscribe, hop over to the Papergang site! How cute! This would make an amazing gift for some crafty stationary lovers I know! I'm with you - frame the card! It's so cute! HAHAHA! May the fourth be with you, oh Vicky, you went there alright. LOL! This is such a cute subscription, not for me but I can see how my husband's cousin would love this! Omg I love everything in the box!!! This is the cutest thing ever, I love stationery so much, I'll have to treat myself to this soon! !